HighStrengthFAST® wastewater treatment systems are ideally suited for use in restaurants, schools, trailer parks, office buildings, commercial properties and other high-strength waste applications. Commercial facilities are among the most challenging projects, often having biological loading (BOD) and Fat, Oil, and Grease (FOG) levels that are significantly higher than standard sanitary-strength sewage. Certain applications may have additional challenges that can affect the wastewater treatment system due to the unique characteristics of a particular facility. Wastewater treatment projects should always be designed with these challenges in mind and never on flow volumes alone. HighStrengthFAST wastewater treatment systems are proven, innovative treatment products that provide robust, high-performance treatment to meet the challenges of our changing world. Dependable, affordable…FAST. FAST® is simply great technology, based on environmentally sound and simple scientific principles. The FAST (Fixed Activated Sludge Treatment) process employs a unique hybrid combination of attached and suspended growth in an aerobic, packed bed bioreactor. 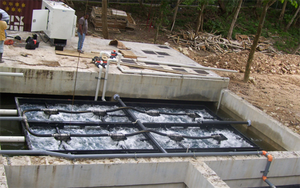 This proven IFAS (Integrated Fixed-Film Activated Sludge) combination includes the stability of fully-submerged, fixed-film media and the effectiveness of activated sludge treatment, making the innovative, patented FAST system technologically advanced and extraordinarily reliable. Nitrification and denitrification projects are much easier with FAST technology. Multiple biological, bio-chemical, chemical and physical processes occur simultaneously within the FAST wastewater treatment system. FAST® wastewater treatment systems have proven themselves to consistently reduce nitrogen levels – including nitrates and all other nitrogen species - at exceptionally high percentage rates.